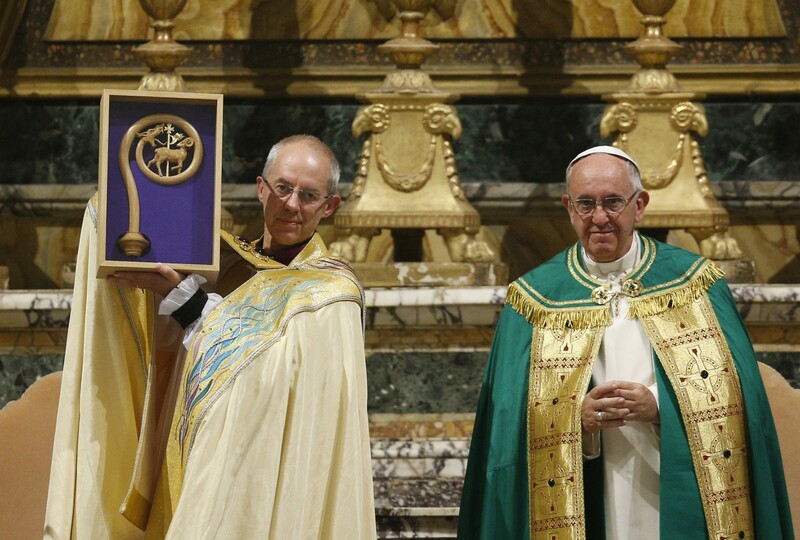 Anglican Archbishop Justin Welby of Canterbury, England, spiritual leader of the Anglican Communion, holds a replica of the staff of St Gregory the Great given by Pope Francis at a vespers service at the Church of St Gregory in Rome, 5 October. Photo: CNS/Paul Haring. Thirty-six Anglican and Catholic bishops gathered in the Vatican last month for an historical meeting with Pope Francis and the Archbishop of Canterbury, Archbishop Justin Welby. They came together to discover new ways for Catholics and Anglicans to give greater witness to their common faith, and how they can collaborate in mission to the world. The meeting was organised by the International Anglican-Roman Catholic Commission for Unity and Mission, known as IARCCUM. Pope Francis and Archbishop Justin Welby commissioned 19 pairs of Anglican and Catholic bishops from the same country or region from around the world to take part in united mission in their local areas. Representing New Zealand were Cardinal John Dew, Catholic Archbishop of Wellington, and Bishop Ross Bay, Anglican Bishop of Auckland. Cardinal Dew said, ‘The Anglican and Catholic communities around New Zealand, from bishops to priests, to diocesan staff to organisations to parishes and communities, enjoy a supportive, affirming relationship akin to an extended family. The meeting was in two parts – first in Canterbury and then in Rome. It began by listening to the bishops’ own pastoral challenges. Cardinal Dew said, ‘We presented in pairs something of the pastoral challenges we face in our own contexts, some of our experiences of working together and our hopes for these days. While we were from many very different parts of the world some common themes emerged: complexity of supporting families in today’s world; environmental degradation; migration; refugees; trafficking; social and interreligious pluralism; secularisation; interreligious issues and young people thinking that one faith is as good as another. The commissioning and sending took place during a Vespers service, led jointly by Pope Francis and Archbishop Welby at the Church of Saint Gregory on the Caelian Hill in Rome. This was the church from where Pope Gregory sent Augustine in AD 596 to evangelise Britain’s Anglo-Saxon people. The service was one of the highlights of an ecumenical summit organised by IARCCUM to mark the 50th anniversary of the meeting between Pope Paul VI and Archbishop Michael Ramsey in 1966 – the first such public meeting between a Pope and an Archbishop of Canterbury since the Reformation. The summit also marked the 50th anniversary of the Anglican Centre in Rome.